Registry Mechanic, from PC Tools, is a powerful, easy-to-use registry cleaner for Windows OS, which the company claims as the world’s most popular registry cleaner with more than 60 million downloads, allowing both expert and novice users to safely clean, repair and optimize the Windows registry aimed to help enhances their system performance without expensive hardware upgrades. Safely scans, cleans and repairs invalid entries in your Windows Registry to minimize Windows crashes and error messages. Remove orphaned references in your Windows Registry to improve performance and stability. Registry Compacting optimizes system performance by analyzing, rebuilding and compacting the registry to remove gaps, corrupt keys and optimize free space. Registry Monitor observes changes to your Windows Registry and alerts you while a specified number of changes have been made to key areas of the Registry. Automatically backs up Windows Registry with each registry repair, allowing changes to be restored at a later time. Creates informative, user-friendly logs detailing errors found and repaired and memory resources available on your PC. Optimize your System with a one-click application of a set of tweaks and patches directly into the Windows registry that are designed to improve system performance. Tune-up your services to improve your PC performance and provide better start-up times by changing the preference of non-essential Windows Services to improve efficiency of system resource usage. Schedule scans to occur on start-up, with automatic registry repair and registry back up. Scans for invalid and incorrect program shortcuts in specified areas of your hard drive. Customizable ignore lists allow you to prevent specific items from being detected and repaired by the registry repair software. Shortcuts to Windows Management tools provide access to useful tools within one location to take control of configuring your system simply and quickly. Clean and clear interface making it easy to optimize Windows performance, regardless of your level of expertise. Built on a modular architecture allowing incorporation of additional features and tools. PC Tools Registry Mechanic 8 normally costs about $30 per genuine license code (which can be used for up to 3 PC). 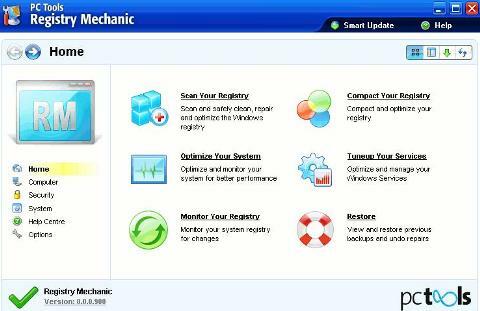 As part of PC Tools promotion with ComputerActive UK, users are entitled to grab a free copy of PC Tools Registry Mechanic 8 full version product for free! Visit promotional page at http://www.pctools.com/en/registry-mechanic/free/promo/INCISIVE0110/. Fill in the registration form and click Request Free License button. A serial key number of Registry Mechanic valid for 1 year subscription will be sent to registered email. Once installed, enter the received free 1-year license code to unlock and activate the Registry Mechanic 8. The promotion you are attempting to access is not valid in your country. If you believe this message to be displayed in error please contact us at: support@pctools.com. PC Tools Registry Mechanic 8 is compatible with Windows Vista 32-bit, 2000 and Windows XP.